This week's new Japanese game release is Yu-Gi-Oh! 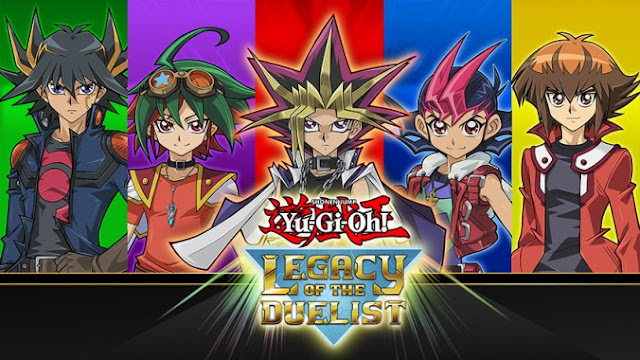 Legacy of the Duelist. In case you were thinking 'But this isn't a JRPG! ', I thought that the game would may be relevant due to the card game mini games featured in JRPGs....also cause I really liked the Yu-Gi-Oh PS One game what I was younger. However, there are a few other JRPG things to talk about, mainly from the Winter Sale. The Winter Sales includes a few action based Japanese games, such as Hyperdimension Neptunia Action U, Guilty Gear Xrd -Sign- and Jojo's Bizarre Adventure and also a few new story based games such as Operation Abyss: New Tokyo Legacy and Hatoful Boyfriend. I considered buying Guilty Gear or Operation Abyss, but I couldn't justify it until I've finished Final Fantasy IX. I have played the Jojo's Bizzare Adventure: All-Star Battle fighting game a little though - the combat is enjoyable, though maybe not as smooth as an Arc System Works fighter. I would still recommend it for anyone who enjoy's the show though - the animations and gameplay are fun enough. I hope everyone is having a good week. Happy gaming! Pick of the week: Jojo's Bizarre Adventure: All-Star Battle for fans of the show because you can't argue with that deal and those Jojo poses.